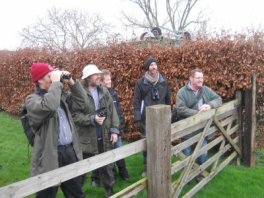 In early January, a dozen local bird watchers met at Roswell Pits on Sunday for the 6th Ely Bird Race.Three groups, each led by a local birder, set off and amassed an excellent aggregate total of 65 species, just one short of the record for an Ely winter bird race. This included a new species for Roswell Pits –Merlin, the smallest European falcon and an occasional winter visitor from northern Englandand Scandinavia. Other interest was provided by three overwintering chiffchaffs (a migrant warbler) at the sewage farm, eking out a living on invertebrates. More and more chiffchaffs are spending the winter in the UK instead of migrating to Africa. Last but not least, there was a large gathering of meadow pipits (25) on the water meadow, mixed in with a flock of pied wagtails. Much enjoyment and discussion was had in the sparkling sunshine. We look forward to running the 7th Ely Bird Race in May, when species numbers will be boosted by our summer migrants, including nightingale. Look out for details on the Ely Wildspace website (www.elywildspace.org.uk), and do come along and join us for what is a very special local experience. Otters are regularly being seen in and around Elywildpace which is very good news but sadly, those taking part in the Bird Race on 5 Jan also found another otter roadkill adjacent to the beet factory settling ponds. This is at least the fifth otter casualty along the 200m-stretch of road between the pond and the river in recent years. 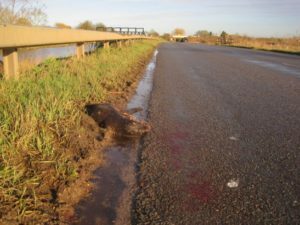 It underscores the importance of the area for otters – and the urgent need for the highways authorities to reduce the risk of further deaths in future. Ely Wildspace is working with otter experts to examine what might be feasible and effective. Thanks to a fantastic turnout, kind weather, and the very generous donation of tools and manpower by Island Landscapes, we had a tremendously successful work party on Sat 25 Jan. We managed to open up two glades, coppicing elders, hawthorn and blackthorn to add more structural diversity to the habitat and (hopefully) make it more attractive for nightingales. We also cleared out a large amount of rubbish, and did some badly-needed maintenance work on the hedge improvements we’ve been making near the river, and to the tern rafts on Roswell Pits. Huge thanks to everyone who came,and to Natural England and Island Landscapes for supporting our work. The next event is a Wildlife Trust work party on Sat 15 Feb; contact Will Burdett (will.burdett@anglia.ac.uk) for details.